This weekend the girls went for a sleepover withe Grandma and Grandpa - they were incredibly excited about it and spent much of the afternoon packing and prepping for their adventure. The girls each packed an overnight bag with one cuddly toy but they also wanted to take a book to read and a game to play; mini games from Orchard Toys are the perfect type of game to pack when travelling away from home because they are so compact and are suitable for family members of all ages. Build a Beetle is a mini game from Orchard Toys in which you take it in turns to spin a number - for each unique number you spin, you get to choose another body part for your beetle. Once you've collected all six body parts your beetle is complete. It is a fun game for Holly who is proud when she recognises her numbers correctly but is is also fun for all of us because of the element of chance - your beetle's completeness is governed by the spinner. Each beetle has a fun friendly face and a totally different costume. The parts are identified by colour. 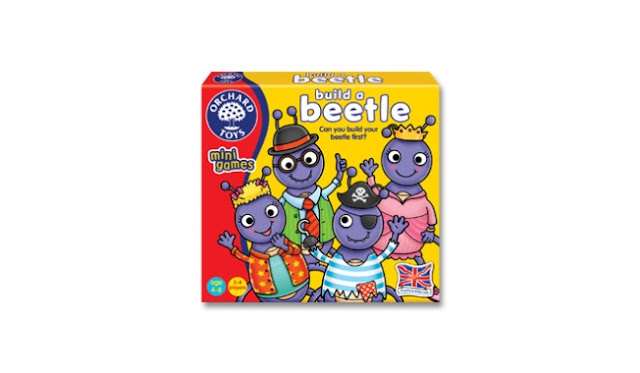 The box for Build a Beetle is so small that it could fit into the front pocket of Holly's rucksack which she took as an overnight bag. For a week's holiday you could take a few mini games with you and not have to worry about filling up your suitcases. In the mini games range you'll also find dominoes, snap, lotto, snakes and ladders and matching pairs all suitable for upto 4 players; they each cost £4.99.